Today’s infrastructures are hybrid in nature, running workloads from the data center and public cloud. With this flexibility comes risk; public cloud opens the door to the potential of a breach while malicious insiders target data centers at the source. Today’s cybercriminals are looking past traditional perimeter security and targeting server firmware. 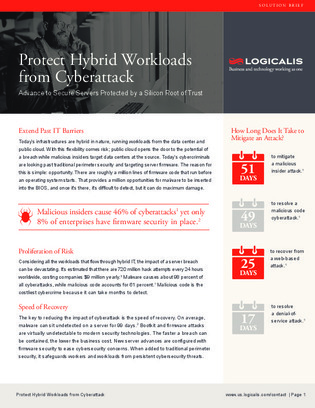 Download this white paper to learn about an approach to protecting your hybrid workloads that utilizes a server specifically designed to protect against the malicious threats targeting your firmware.